Audio is amazing. Let’s just get that out of the way. As a medium, it is all consuming. Putting in your earbuds and diving into a podcast episode or turning the dial to a radio station is an intentional and intimate act. The conversations are so intimate and revealing, listeners often think of podcast hosts as “friends.” There are so many great things about working in this space. But there’s one thing we all struggle with: discovery and sampling. The power of a movie trailer or TV promo is clear. These videos (if well done) can make or break a project. A great trailer gets people’s butts in those $14 movie theater seats. In my business, the project isn’t visual — it’s a highly produced piece of audio, whether a 10-minute news feature or a 60-minute podcast. Audio’s version of “butts in seats” is a listen. Getting people excited about listening on social media is hard when there isn’t a technical solution for sampling a piece of content. You can’t upload an mp3 to Facebook, Twitter or Instagram. And the thing with audio is— it’s invisible. Social platforms often work against our audio content even when we share it as a link to our website. It’s no secret that these platforms employ algorithms that give special treatment to native video content. Native, meaning uploaded directly onto a platform, no links needed. I’m not blaming them; social platform execs have the same desire most marketers have, to keep people on platform. It’s not surprising when many suppress posts (like links) that take users away from their news feeds and favor posts (like videos) that keep users onsite. 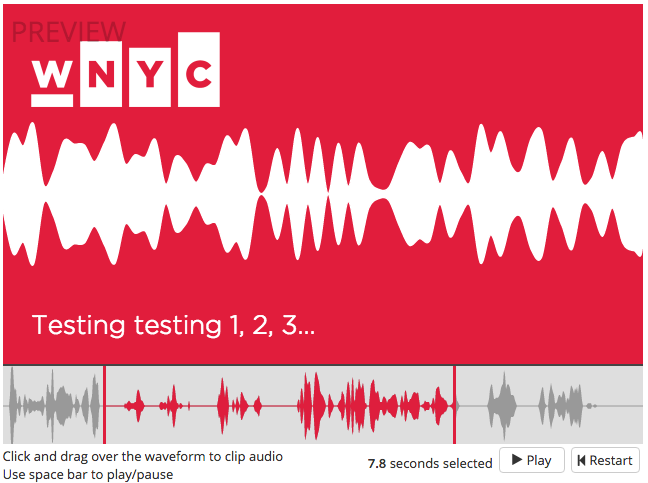 Today, WNYC is open-sourcing its Audiogram Generator, a social tool meant to provide podcasters, radio professionals, producers and audio makers a super easy way to share their work across social platforms including Facebook and Twitter. The tool turns .mp3 and .wav files into movie files. It gives users the ability to add captions and custom background images under a dynamically generated waveform. That’s it. And you can now use it too! But first, some more background…. In July 2015, WNYC approached New York Magazine about co-producing short summer features. The result was an on-air series called 90-Second New York. We worked closely with the social media team at New York Magazine to promote the series, and one idea they put forth was based on their audio Instagrams. The posts looked like a photo, but if you hit play you could hear the audio. These tests all involved pretty short pieces of tape, often under a minute, and our audience loved them. We wanted to see if we’d get a similar reaction by posting longer pieces, like an entire 45-minute episode of Alec Baldwin’s Here’s the Thing podcast. We loaded it onto Facebook (ad-free to comply with the platform’s branded content guidelines) and scheduled it to go live the same day as it would everywhere else — iTunes, Stitcher, our own website, etc. Before making the move into audio, I worked on the social media team at two large TV networks. Part of my job was overseeing all community management, including requesting promos, clips and sneak peeks of TV shows for our social media accounts. I found that 30 seconds was the optimal time for these videos — and might also be for WNYC’s audiograms. Next step: design and function. Those early audiograms didn’t move, they relied on images and they lacked context. I was doing the best I could — using my limited Photoshop and iMovie skills to cobble them together with static jpegs and mp3s. Alright, so all bragging aside, we’re pretty excited to share this technology with the world. You can find the code for the Audiogram Generator on New York Public Radio’s GitHub. The generator is designed to be usable by a single individual or a large organization (at NYPR, we already share it across dozens of shows and podcasts) and to be customizable for your needs. It’s an ongoing project — we hope to add new features like closed captioning and custom image uploads in the coming months. NPR has also been experimenting with native social audio, for example: their convention NPR One app animations. Our hope is to find other companies and shows that are willing to test this tool and give feedback as we continue to explore new possibilities for this medium. Sign up to join NPR and others below. Audio isn’t going anywhere, and neither is social media (much to my family’s dismay). We hope that the Audiogram Generator can be a first step for native social audio that catapults our favorite medium into the limelight for the entire audio industry. Want to join the audiogram revolution? WNYC will host two live chats in the coming weeks for any organizations interested in using the Audiogram Generator. The first will be for developers and designers to talk to Noah about the code, requirements and installation. The second will present our case study with WNYC’s early findings, some best practices and social stats. >>Sign up HERE to let us know if you’re interested in learning more, and we will be in communication regarding the webinars, feature updates, and examples that we love! You can also sign up for the Social Audio slack channel on the form. If you want to skip all that and just grab the code, you can do that here. You can view our “How to Make and Upload An Audiogram” Google Doc here. It can easily be adapted to work at your company as well. We will be using #Audiograms to talk about this on Twitter. See you there. Thanks to Mandy Naglich and Noah Veltman.